HomeNewsHUSQVARNA FACTORY RACING’S JASON ANDERSON AT SAN DIEGO SX! The Rockstar Energy Husqvarna Factory Racing Team invaded PETCO Park in San Diego, CA for the sixth round of AMA Supercross on Saturday. Jason Anderson dominated the night by taking home another 450 victory and extending his points lead in the class, while teammates Dean Wilson and Mitchell Harrison both battled their way to top-10 finishes. Jason Anderson got the holeshot in his heat and pulled away to take the win and transfer to the 450 Main Event. He was top three at the start of the Main and quickly moved into second. He stayed consistent and rode smart then made the pass for the lead right before the finish in the 11th lap. He rode a perfect race all the way to the finish to take the win. Dean Wilson was top 10 at the start of his heat and was riding smooth before having to maneuver around a downed rider which caused him to go down. 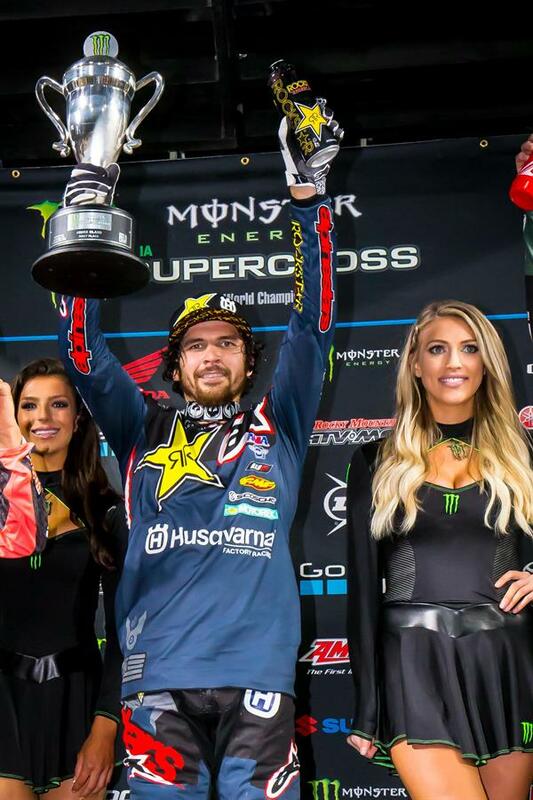 He remounted in 14th and worked his way up to a ninth place finish to transfer to the 450 Main Event. He was mid pack at the start of the Main and rode steady in 11th before charging into the top-10 halfway through the race. He stayed focused and finished ninth. Mitchell Harrison was third at the start of his 250SX West heat but an early mistake put him off the track and to the back of the pack. He quickly rebounded and moved into the top 10 by the second lap, then kept it steady to finish seventh. He was top-10 at the start of the 250 Main Event and was on the move. He rode a smart race and stayed consistent to finish ninth. He is currently ninth in 250SX West rider point standings as he heads into a long break while the 250SX East riders enter the season.